Fans of I Was Told There’d Be Cake and How Did You Get This Number know Sloane Crosley’s life as a series of relatable but madcap misadventures. In Look Alive Out There, whether it’s scaling active volcanoes, crashing shivas, playing herself on Gossip Girl, befriending swingers, or staring down the barrel of the fertility gun, Crosley continues to rise to the occasion with unmatchable nerve and electric one-liners. And as her subjects become more serious, her essays deliver not just laughs but lasting emotional heft and insight. Crosley has taken up the gauntlets thrown by her predecessors—Dorothy Parker, Nora Ephron, David Sedaris—and crafted something rare, affecting, and true. 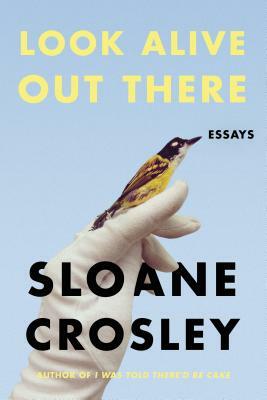 Look Alive Out There arrives on the tenth anniversary of I Was Told There’d be Cake, and Crosley’s essays have managed to grow simultaneously more sophisticated and even funnier. And yet she’s still very much herself, and it’s great to have her back—and not a moment too soon (or late, for that matter). Sloane Crosley is the author of the New York Times bestsellers I Was Told There'd Be Cake (a Thurber Prize finalist) and How Did You Get This Number. A frequent contributor to The New York Times, she lives in Manhattan. "It's not a shallow kind of laughter: Crosley provides depth and social commentary that give her essays resonance." —The Amazon Book Review, "Five of the Funniest Books of 2018"